Calgary is the largest city in the Canadian province of Alberta, according to a Conference Board survey, it is the most livable city in Canada. 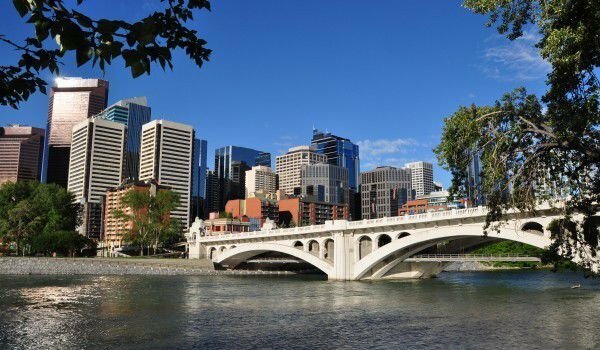 Calgary is situated in a fertile region among picturesque meadows and pastures in the high plateaus of 80 km east of the Canadian Rockies in southern Alberta. Currently the population of the city of Calgary is about one million people and with the number of suburban residents, this figure jumps to 1.5 million. Once, the city was known as Cow town. In the 19th century in the village lived about 1000 people, but with the construction of railways and the discovery of oil reserves Calgary began to develop rapidly and is today the fastest growing city in Canada. Since 1996 the population grew by almost 25% to 2006, Calgary now has 1.25 million inhabitants. Calgary is the largest Canadian metropolitan area between Toronto and Vancouver. The city remains forever in the history of Olympic sport, with the Winter Games held in 1988. In 1787 David Thompson became the first European to visit the region, spending the winter on the banks of the Bow River. In 1873, John Glenn made a founding document of European settlement in the region. Even then, until 1970 the hunting of bison has been widely advocated in these lands. In 1875 a post was built for the Northwest mountain police called Fort Brisebois, which a year later was renamed by Colonel James MacLeud to Fort Calgary. The name comes from the Norse words "kald" and "gart", meaning "cold" and "garden". In 1883 the Canadian Pacific Railway reaches the borders of Calgary. 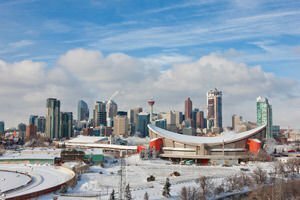 Today, Calgary is a developed industrial city with oil industry, while it is also an excellent place to visit as many resorts are located around Calgary. Several of the most beautiful lakes in Canada are located an hour's drive from the city. Among them are Peyto Lake and Moraine Lake, within Banff National Park, about 130 km from Calgary. The city itself has many museums, cultural and historical landmarks and places of entertainment and recreation. Calgary is the annual host to many festivals and cultural events, including the Calgary Stampede - rodeo and agricultural exposures, which are regularly held in July since 1912. Calgary hosts an International Film Festival, Folk festival, Comedy Festival (Funny Fest), International Festival of Writers, cultural and ethnic festivals, and many different others. Emblematic of Calgary is the 191 meters high eponymous tower which was built only in one year. Construction began in 1967 and in 1967, it was officially opened. Calgary Tower is the tallest building in Canada and is open to tourist visits. Tourists can climb to the top and enjoy stunning views of the entire Canadian province. Also remarkable and elegant is the bridge over the Bow River. It was opened in 2009 and is 130 meters long. Designed by renowned Spanish architect Santiago Calatrava, it is bathed in red and white and is called the "bridge of peace". In Calgary was built the largest mosque in Canada, called Baytun Nur, which translated from Urdu means "house of light". On one of its facades can be seen the 99 names of God, written in Arabic. The Great prayer hall of the temple can accommodate up to 1 500 worshipers and other facilities can hold up to 3 000 people. Among the most famous museums is the Glenbow Museum. It was founded by Eric Harvey in the 50s of the 20th century, he began to collect materials related to the history of Western Canada. Today the museum has a rich collection of artifacts from North America, telling the story of the area with local Aborigines, Europeans and development in the western lifestyle. There is exposure of extremely valuable works of art from Asia, West Africa, South America and the Pacific Islands.